Welcome to the Earrings Everyday Blog Hop! Earrings Everyday hosts a monthly earring challenge and blog hop. We post a picture on the Earrings Everyday blog to inspire your earring designs and then one month later we have a blog hop to see what everyone has made! Here is the picture for March. My earrings were inspired by the flowers on the quilt and in the tapestry. 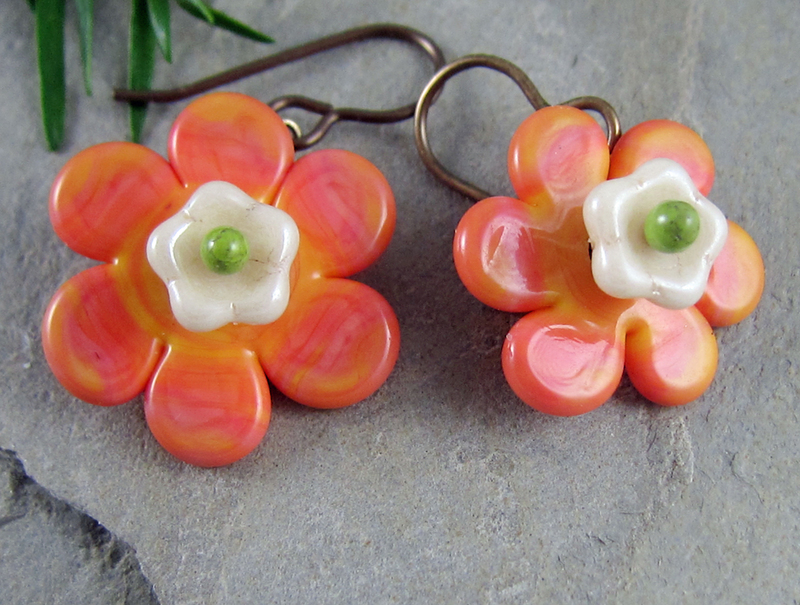 The earrings aren’t the same colors as in the picture, but I had the orange lampwork flowers on hand and I had fun layering the flowers. The cream colored centers remind me of the trumpet centers of daffodils. Our previous house had a big field in the back, where over the years, my husband planted over one thousand daffodils for me. At this time of year we had bouquets of daffodils in nearly every room and a big bouquet at work, too. Every spring I think of our field of daffodils and how that was one way in which my husband said “I love you.” to me. Now comes the fun part. Click on the link below to get links to all the challenge participants. Then visit their blogs to see all the wonderful earrings they have created! 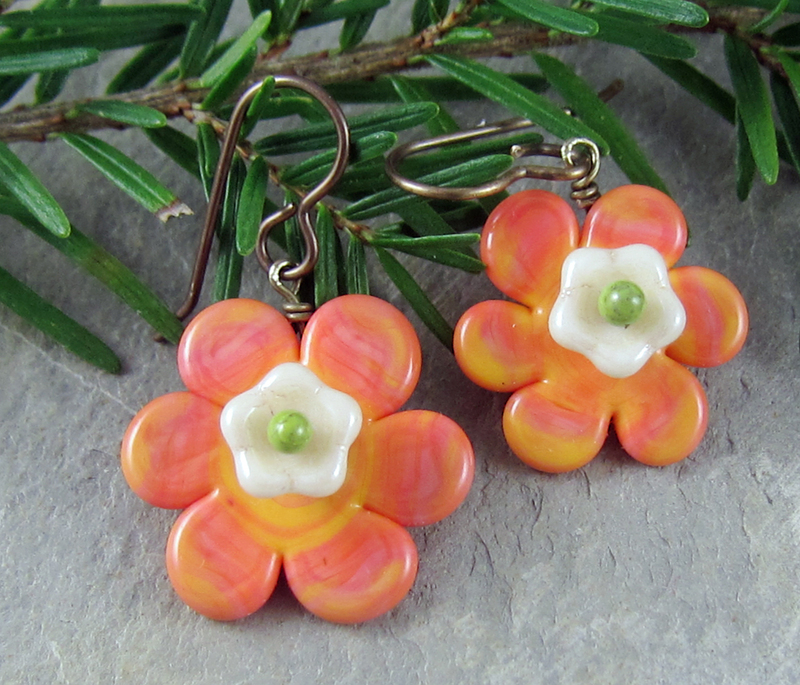 This entry was posted in Art Beads and Components and tagged blog hop, daffodils, earring challenge, earrings, Earrings Everyday, flowers, handmade earrings, jewelry, Linda Landig, spring by Linda Landig. Bookmark the permalink. Lori- I’m not quite happy with the way that they connect to the earwires. So I’m going to rework that part and then they will be for sale. Would you like me to contact you when they are ready? These are so bright and cheerfull, perfect for spring! Thank you. Spring always puts me in a happy state of mind. My jewelry tends to reflect that. Simply Beautiful! Way to use what you had on hand….that’s part of what I’m liking about these challenges…using up my stuff. I have an embarrassingly huge stockpile of “stuff” too. I like that we can use what’s on hand too! Very nice – loving the stacked flowers! Spring and love. Can’t beat that combination! I love the story of your husband and the daffodils, as I am looking at the daffs blooming in my garden right now. Spring is the best time of year. The orange in your cute earrings just makes me smile. Thanks Cindy. These earrings make me smile too! Lovely earring design. I’m curious…do you have a trick for getting center-hole components like these to hang correctly? I’ve been fiddling with a pair of lucite flowers with center holes for the past week and no matter what I do, they tip forward once they’re all wired up so they don’t hang right. I’d never made stacked flowers like these before and I struggled with that problem too. In fact, I’m still not satisfied with the mechanics of this pair of earrings, which is why I won’t place them in my shop till I get that figured out. If anyone reading this has a suggestion for Kelly and I, we’d love to hear it! Love the way you stacked the components for the 3D effect! And what a lovely way your husband shares his love with your every spring with a flower field! Your earrings are sweet and so is your love story! Oh Linda – I love your earrings. And the story or your husband planting all those flowers!! LOVELY! Thanks Alice! I love springtime! Your earrings are so pretty, simple and cheerful! Thanks Karin. Spring flowers make me cheerful! Daffodils are one of my favourite flowers. We’re supposed to get 6 inches + of snow tomorrow, so it will be a while before I see the real thing in my garden – your earrings are a lovely little pick-me-up. Linda, the earrings made me smile when I opened the post and saw them. Fabulous job! So perfect! Love the flowers! These are beautiful. I love the green of the headpin with the orange and pink flowers.